Former Fayetteville State DB to make CFL debut. Fayetteville, NC – Former Fayetteville State defensive back Brian Walker will kick off his post-collegiate football career with the Canadian Football League’s Winnipeg Blue Bombers. His debut will be Saturday, July 1st against the Saskatchewan Roughriders at 9 pm. Walker finished his senior season accumulating 25 total tackles, seven pass breakups, and two interceptions. As a kick returner, he amassed 11 returns for 373 yards with two touchdowns. In the Broncos season opener against Chowan, Brian had six total tackles and an assisted sack (four yards behind the line of scrimmage). In the final game of the season against Winston-Salem State, Walker returned a kick 99 yards for his second score of the season. 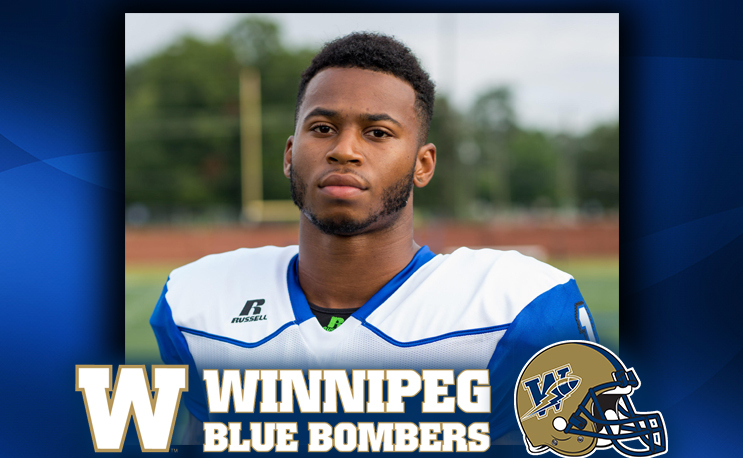 In the Blue Bombers two preseason games, Walker finished with a combined five tackles and one interception. He signed as a free agent on May 22. The Winnipeg Blue Bombers finished third last season in the CFL’s Western Division with an 11-7 record. Their defense ranked first in turnovers forced (59) and defensive touchdowns (5). Brian Walker is a native of Charlotte, North Carolina and a former standout at Mallard Creek High School. He transferred to Fayetteville State from UNC-Chapel Hill, where he played three seasons. Fayetteville State will open its football season on September 2nd in Murfreesboro, NC against Chowan.